Russel Lazega is an attorney and author living in North Miami Beach, Florida. 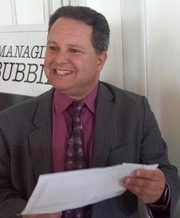 He is a columnist for the Aventura News and the author of several nonfiction publications, including Florida Motor Vehicle No-Fault Law and Practice (PIP). Russel Lazega is a LibraryThing Author, an author who lists their personal library on LibraryThing. Russel Lazega's book Managing Bubbie was available from LibraryThing Member Giveaway. Russel Lazega is currently considered a "single author." If one or more works are by a distinct, homonymous authors, go ahead and split the author. Russel Lazega is composed of 1 name.